In a small room, or a small apartment in general, choosing a color scheme is a tricky task. But the good thing is, in small apartment, you can choose a color you really like, since it doesn’t come in large doses. But before you even start considering what color to paint the apartment or the room for that matter, you need to think what you want to achieve with the paint. Do you want to make the room look and feel bigger, or do you want to make it feel cozy, warm and comfortable. The basic rule is that for small rooms to appear bigger, you need to go for lighter shades, while for coziness, you need to opt for saturated and rich hues. Sunny colors work wonderfully in rooms where you start the day, such as the kitchen and the dining room, as sunny colors light up your mood during the breakfast and the morning coffee. Another thing to consider is that nowadays, you can virtually paint a room using tools and programs. There are several free tools available online, such and they can help you paint your room using your computer, and see how the space will look afterwards. One of those tools is the Personal Color Viewer by Benjamin Moore. You just need to load a picture from your space into the tool and you can then paint it. But let’s get to the color options. Most people will opt for white and light colors in a small apartment. But a dark color is a trick that gives your small space depth like no light color can provide. 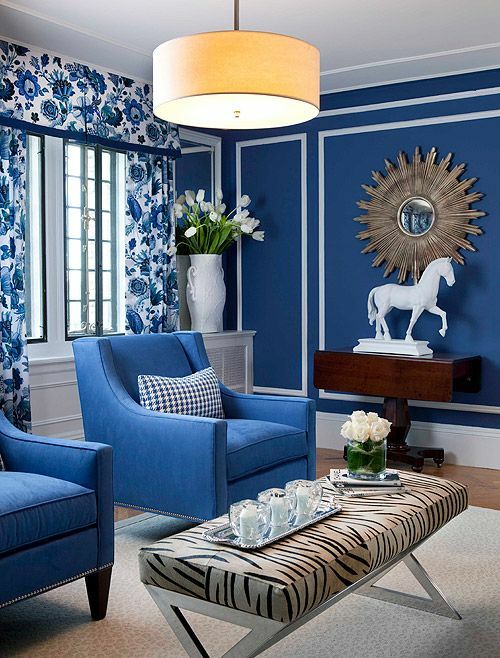 Designers often use this trick, and when it comes to dark colors, the navy blue is an ideal choice because it is dark, it has texture, richness and is very pleasant and easy to combine with light accessories. Painting the room in navy blue fools the eye where your walls begin and where do they end, resulting in an illusion of bigger space. Important rule to follow is that painting the room in dark color such as navy blue requires balancing with reflective materials for extra light, such as mirrors, metallic elements and furniture with mirrors. Add a lamp for warm glow in the room. Nowadays, scandinavian design is a huge hit in the world of interior design. And one of the basic principles of the design is adding as much natural elements, mainly wood in the design of the apartment. 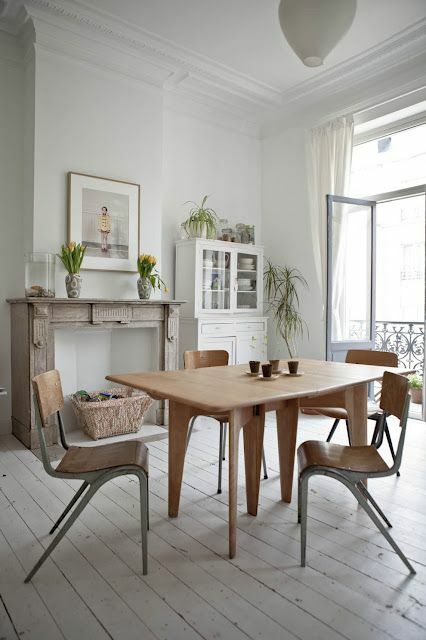 Many opt for wooden furniture, and that is great. But even better is to accompany the wooden furniture with a color that also feels natural, but it doesn’t pop much. Light brown is one of the best choices here, as it can blend perfectly with darker tones for the furniture and result in an ideal mix. If your furniture is light brown color, using dark brown on the walls will not create the same effect. Mixing light with light shades is a mistake. While the room and the elements will blend in, in a small space it will look crowded. This is the color that comes first to mind when you think of an option to visually increase the space. There are many benefits of using white for your small apartment. First off, white is as clear and as pure color as there can be and it is best for creating an illusion of bigger space. White is also a neutral color, which allows you to experiment with other colors for the furniture, and accessories. The good news about white is that it comes in many different tones and shades. Forget the boring classic white, and opt for some other shade of the color. Speaking of neutral colors, the next in line after white is the beige color. Beige allows a lot of possibilities and gives you flexibility. It is a color very close to the wooden tones, but different in its own way. Same as white, beige comes in many different shades and options, such as cappuccino, ivory, cream and much more. Another benefit of beige is that even though it is a neutral color, it gives a sense of warmth and provides aura that is perfect for small spaces. And the best thing is that beige can be combined with everything. As a color, beige offers you the flexibility to go for modern, vintage or eclectic interior design. We mentioned bright colors at the beginning, and one of the brightest of them all is the sunny yellow or lemon yellow color. Both colors work great in a small living room, as they bring the sunny ray of the sun into the room. As a color, yellow is calming, and inspiring in the same time. But just make sure that you opt for a light and sunny shade of the yellow, not some bold and neon shade. Neon shades improve the energy levels in the apartment, but in a small room, they might be too much.